A few of us have just completed a short visit to the orphanage where we worked on our water system. 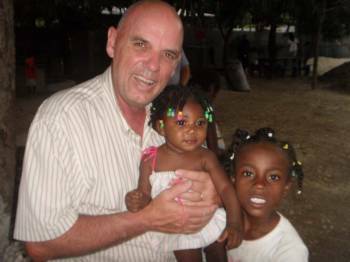 We were joined on this trip by a returning visitor and longstanding friend of Fond Blanc, Mike Verheyen, who was making his third visit to the orphanage in the last four years. Mike had reached out to me a couple of months ago at a time when he had the children of Fond Blanc on his mind – and they are always a pleasant distraction from those northern winters. We were so pleased Mike could join us on this trip and I was curious to get his thoughts to share with all the friends of Fond Blanc. We found time to sit under the mango tree and visit. Q: Your abiding affection for the children of Fond Blanc is well known around here. What brought you on this particular trip? Mike: Every time I am with my grandchildren, I see the faces of the Fond Blanc children in them, and every time I am with the children of Fond Blanc I see my grandchildren. I just love being around these children. Their unconditional love just shines through in everything they do. Q: You have been here twice already on “mission trips” with your church. How is the experience different for you coming back without a big team of folks? Q: On your first visit to Fond Blanc in 2012, we did not yet even have a place for mission teams to sleep here and you had to “commute” from Cabaret on a team bus every day. You saw a much earlier version of Fond Blanc four years ago. Can you reflect back on those days and comment on the overall changes since 2012 that stand out to you the most? Mike: The changes are so much for the better. Just staying here gives us more time to intermingle with the children and the staff. The facilities are so much better for everyone. The growth has been phenomenal. I noticed the future housing for the staff under construction. The new church is progressing. Everyone’s quality of life is so much better. The new kids’ showers. The healthier meals. Just look at the vitamins they take now! They never had that in the past. Movie night for the kids was special. Bags of popcorn for everyone! Things we take for granted at home are such a special treat for these kids. By the end of the movie everyone on the grounds was there watching, even Pastor Shmy. And the adults were laughing just as hard at the movie as the kids were. What a great sense of community there is now! I wonder how it would work if we did that [movie night] down in the village? Maybe we could show the movie for all the kids in the town and the mission team could help with crowd control. Q: Some visitors worry that they will be forgotten. How have your personal relationships with the children held up over time? Mike: I remember many of the children from our previous visits and they obviously remembered me. As soon as I arrived, they saw me and started calling out: “Canada! Canada!”, so there is no doubt they remember me from earlier visits. I’ve had fun with a lot of the children before, but I’ve built more relationships this time because now I am not so focused on trying to complete a “mission” job as I was before. I have learned in my life that the relationships are the far more important thing. On this trip, in the mornings when the day is just getting going and I am connecting with the kids, we try to converse using my broken French and their broken English. It works surprisingly well, but sometimes I think just holding them in my lap is the best part. Q: Even without a team, you’ve still been a big help with the “project” work on the water system this week. There is always a long to-do list around here. What jumps out at you in terms of things that you think need priority attention? Mike: I did not realize that just changing the location of the water pump and changing the water system would have such a big impact on the children’s lives. It seemed like a small thing at first, but re-plumbing the water intake system and dramatically increasing the water flow into the tanks on the roof – now there will be a dramatic change in the whole system. Now the kids can use their new showers without a fear running out of water. Now we can use the new washing machine more frequently. Now we can treat the water [with chlorine] before it gets used. In terms of priorities, I have to say I was shocked when I looked in the kids’ toilets. They are in dire straights down there. I also think they need a bigger play area just to be kids. If I could see two things fulfilled those would be the top two. Q: What would you say to people who are thinking about a return trip to visit the children of Fond Blanc? Mike: Definitely come down! The unconditional love you receive from the children is really second to none. You can see the hand of God working on them and through them. I think it means a lot to return. They may not remember your name but they remember you. You can really tell they keep us in their hearts and minds. There is something very special about living with the kids around the clock while we are here. For me, the visit brings it all down to reality to see how happy these kids can be with so little materialism and so few possessions. It always warms my heart to see that. I try to take that back with me to Canada and I try to spread that message that stuff is just stuff, and at the end of the day it doesn’t mean all that much.